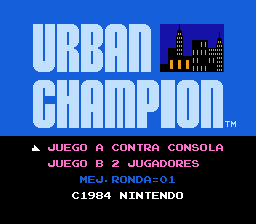 Urban Champion. It’s a story about two guys that don’t like each other but like the same girl. This game skips all the drama and gets right to the good part. The fight, and fight they do, for three to five rounds until one of the guys get knocked into a manhole while the victor gets showered with confetti from the blue haired object of their affections. 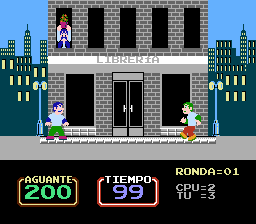 The player controls the character with blue hair while the computer or second player takes control of the guy with green hair. 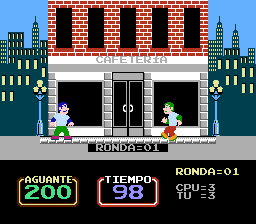 The fight through a total of six city backdrops that are part of a city block. 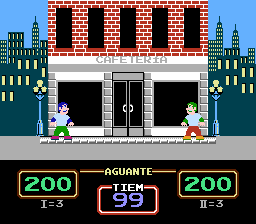 They beat the daylights while avoiding getting caught by the occasional cop car and getting a flower pot dropped on their heads by an angry shopkeeper. 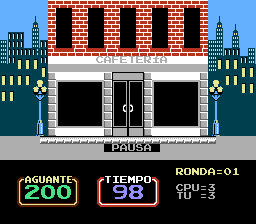 Translation to Spanish for “Urban Champion” for the NES.